Thorlo Socks - A Love Story! A love story about Thorlo socks? Why would you want to love your socks? After all, aren't socks the most ignored and overlooked part of your walking 'equipment'? Well you're right. They are! That's why you need to keep reading! Learn how important your socks really are to your foot health and walking comfort. Once you do, we're pretty sure you'll love and appreciate your Thorlos Padded Socks as much as we do ours. When you combine properly researched, designed and built socks with proper fitting walking shoes, magic happens. Your walk really becomes a joy! Imagine for a minute wearing socks that are properly padded (where our older feet need it the most), fit perfectly, prevent blisters and leave your feet feeling great after your walk. No pain. No blisters. No discomfort. Just feet that feel great! Your feet deserve this! Read too what so many other satisfied customers have to say about their Thorlos Padded Socks. It is pretty unusual to see so many people so happy with socks! One little known fact about our feet is that as we age, something called 'fat pads' on the bottoms of our feet deteriorate. By the time we're over 50 we've lost a good portion of that fat padding. That fat padding is what absorbs a lot of the shock when we walk. Thorlo designs their sock padding to make up for this loss of natural fat pads in your feet as you age. Learn a lot more here about this very important factor. Thorlo, located in Statesville, North Carolina, USA only makes socks. Nothing else. They've been doing so since 1953. Jim Throneburg, son of the founders Lewis and Mattie, is still president of the company today. JIm also established the Thorlos brand in 1983. Have a look at Jim's video - "How It All Started". You will as our grandson says - "feel the love"! Thorlos mission is to make your feet feel better no matter what your type of activity. NOTE: we've had the pleasure of speaking personally with both Jim Throneburg (Owner), Jeff Lawson (Marketing Director) and Susan Graham, Product Specialist. We can vouch first hand for their passion, enthusiasm and deidication to your foot protection, health and comfort. Thorlos Padded Socks are truly 'best in class'. Thorlos produces over 30 activity specific types of socks - be it sport, outdoor, winter, workplace, military or everyday use. Their socks have been to the North Pole, Mt. Everest, Augusta National and to Wimbledon where Martina Navratilova volunteered her own endorsement - “For my feet, it’s Thorlos and only Thorlos”. Here are just two of over 30 types of activity specific socks made by Thorlo. 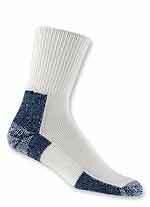 These socks will make your feet feel great and your walks so much more enjoyable. Be sure to fully read the descriptions to better understand each custom design. NOTE: Be sure to click on the picture of an individual sock. There is a whole lot more valuable information there along with what other users of that exact model think. NOTE 2: For more choice by activity type, be sure to click on the THORLO word under the brief paragraph at the top of the page. "These socks are designed to help protect your feet from the damaging forces of impact, shear and blistering that are common to walking." When you first visit the Thorlos Walking Socks page, click on the "Learn More' link in the description. You'll really appreciate what goes into creating the Thorlo Walking Sock magic. "Running Thorlos are designed to help protect your feet from the damaging forces of impact, shear and blistering that are common to running". Note: we include running socks as well. This is both for those of you that are very fit and also do some running. However they also have extra padding that you may find beneficial for your feet. Should you suffer from arthritis foot or diabetes foot, Thorlo has suggestions and possible solutions for you as well. First we recommend you read the background information on these specialty socks. Click on the Learn More tab on these pages for complete info. FREE CONSULTATION You're welcome to consult directly with Susan Graham, their sock specialist in all matters of foot health, foot care, specialized sock selection and fit. She specializes in socks for diabetes and arthritis foot conditions. Susan will take as long as it takes to ensure you're properly cared for. You can reach Susan directly on her toll free at 800-438-0286, ext 7254, 8-5 EST Monday-Friday. You can also reach her by email at sugraham@thorlo.com to have your personal foot care needs looked after. Susan is just a super person to work with. On first blush you may think these socks are expensive. And until you experience them for yourself, that is an easy conclusion to reach. However we can say from personal experience that the value you receive is very high. We've never been disappointed. When we sold Thorlos Padded Socks directly, they were our biggest sellers and we never had one complaint or return. Read more here about what real consumers say about the Thorlos Price-Value relationship. The old adage of you get what you pay is so true here. Our enthusiasm for Thorlo socks is just one more example of our commitment to our quality and value recommendations for you. Do try a pair of Thorlo Socks. We wont go back to anything else! Enjoy the pleasure and comfort of walking with your new Thorlo Socks. Your feet will thank you.